This one is pretty new to me I have to admit. A UK beach holiday, that is. Well, it’s new for my current lifetime, however in my previous life as a carefree toddler and child, somewhere very close by did feature significantly in my life. What am I talking about, you ask? I’m talking about Dorset and more precisely, Sandbanks, near Poole and Bournemouth. According to Wikipedia; ‘ the 4th highest property value in the world’ is this small peninsula crossing the mouth of Poole Harbour. Also know as Britain’s ‘Palm Beach’ apparently! I didn’t see enough to feel qualified to truly comment on our overnight stay but I can say that I saw some stunning properties on the drive down to the hotel which sits in pride of place directly on the blue flag beach on its one side and a gorgeous view out to the natural bay of Poole Harbour on the other (hence rooms are either sea view or harbour view-neither too shabby!). I mentioned earlier that Dorset played a large part in my childhood and that’s because my grandparents used to own a beautiful penthouse flat in Bournemouth, choc full of antiques and more importantly collapsible sun loungers which doubled as tents on their balcony. We spent many, many joyous days in the sunshine on that balcony or walking on the beach, playing crazy golf or on the pier with our Zaida (grandpa). You see, Bournemouth and it’s surrounds enjoys a very pleasant micro-climate with less rain and more sunshine than elsewhere so if you want to take your kids to the beach in the UK there is no better option. I digress. I need to explain that my best friend has three children and has been raving about the Sandbanks Hotel to me for ages. In the past I tended to ignore her in favour of Ibiza, or the Maldives or Thailand or the French Riviera but last week whilst we were in the throes of a boiling summer week with temperatures spilling over the 30 degree mark we agreed to drive down from London (2 hours in no traffic but pick your time carefully!) with our 8 month old and spent a night there. This place is apparently the place to go with kids. Their kids club – The Funsters – is unrivalled and believe me, from seeing my best friend’s 3 kids being entertained from dawn ’til dusk I can see why. In fact, their kids club is one of the biggest draws for visitors to the hotel. That said, the room was comfortable, clean (my biggest bugbear) and modern with all the mod cons one would expect from a good four star hotel. Many, as ours did, have balconies with stunning views of beach and seaside that most forget exists in this country! The hotel also has a lovely outdoor terrace with restaurant, bar and chillout area where people generally lounge all day, snacking, sipping Pimms and relaxing in between the beach or the sea. Along with sun loungers and off to the side, a children’s pirate ship themed playground ( that’s not forgetting that there is also an indoor pool to keep them occupied if the beach or the on site watersports academy weren’t enough!). For the adults there is also a steam room, gym and beauty rooms with access to the spa as well at the nearby Haven Hotel. 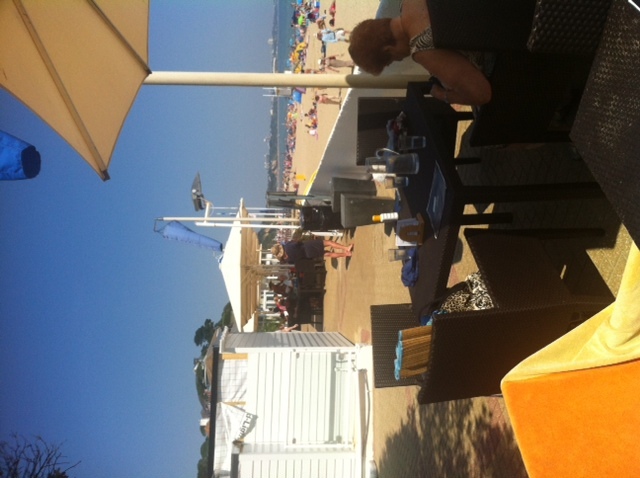 The Sandbanks caters amazingly well to people with young families and staff to guest ratio seemed very high. They are part of a group of four hotels in close proximity; FJB Hotels, so they also have a dine around option which is handy if you fancy getting out and about to explore. The food is plentiful and again with many options for the youngsters. So, all in all, I would say give it a go. But, be careful, if you are taking young children with you, you may be obliged to return over and over again!